One thing that’s great about living near the Mall of America is getting to visit some of the great attractions. My favorite go-to attraction is always Nickelodeon Universe. The rides give just enough thrill, but not too much. It climate controlled and a perfect place to have younger kids ease into some of the bigger kids rides. The rides at Nickelodeon Universe are designed for an indoor setting. In some ways that’s great. The water rides were designed not to get you soaked, unlike outdoor parks. Being in a confined space means, they have to get creative on the rides creations. This space constraint means there are no big dropping roller coasters either. That’s why I think this park is perfect for a younger audience. The staff genuinely wants your family to have a great time. My daughter went on one of the roller coasters, and when they went to check her lap bar, she started freaking out, thinking it would be scary. Instead of getting her out, the ride attendant took the time to ask her what was wrong and went through what might be considered scary about it. I am so thankful for that operator patients because my daughter wasn’t believing me when I said the same thing. After the ride was done, she was running back to go on it again. It’s the little things that make all the difference in the world. Kid’s rides start at 3 points and generally stay that price. The only time they are not is when they are ‘Family’ ride like the Paul Bunyan Log Chute ride. There are 11 rides in total for kids, 16 if you include the family rides. If your kids don’t meet the height requirement and a parent needs to go with, they are free. During the day, kids rid are not all running. They’ll have schedules posted with the times the ride will be running. The ride attendants alternate every 15-30 minutes between rides, so you’ll get the chance to get on them all. If you plan for it, you’ll be able to take full advantage of your time. Thrill Rides run about 8 points apiece. Except for Brain surge and Splat-O-Sphere, they are all roller coasters. Form my own personal experience, these rides pack a punch. They have you flipping, dropping and swirling around. If you need any more convincing, just listen to the screams of the riders. The specialty attractions and rides are throughout the mall. Some are inside the park, while others are near the food court on the west side. None of the attractions are included with the unlimited ride wristband. These are something you should try out when you are just heading to the mall for a fun night, and not planning on doing all the other rides. What I love about Nickelodeon Universe is that they are always trying to change it up and add in more thrills. One of the newer things that I’ve been dying to try is the Dutchman’s Deck Adventure Course and Zipline. Unfortunately, whenever I go, I’m with the kids and I don’t want to make them sit back and watch me. Fly Over America is technically not part of Nickelodeon Universe Rides but is still inside the park. This is a motion simulation ride that has you flying over some famous landmarks. I’ve been told it’s really cool, but it’s still on my list of things to do. Moose Mount Adventure Golf & Rock of Ages Blacklight Mini Golf are both outside the park near the food court on the third floor. Moose Mountain Golf is an Outdoors North Woods-inspired Miniature Golf experience. The Rock of Ages Blacklight Mini Golf is perfect for you to bring your hot color and reflective clothing too. Both are fun experiences. All of the games are located close by the Main Rotunda and American Girl Doll Store. They have an arcade and carnival style games. But don’t think you’re going to go home with an oversized stuffed animal anytime soon. The games are a side note, and most of them are all luck based having you throwing ping pong balls and stuff like that. This is the ten thousand dollar question on reading the public behavior. If it’s raining outside, snowy, abnormally cold, a weekend or a school holiday, it’s going to be crazy. If it’s beautiful outside, a blizzard, during a weekday or a holiday people that people like to spend outside, you’ll be able to walk right on any ride. I’ve also had luck right when they open and after 7pm. The mall has a crazy way of bringing people in and keeping them there in an excellent climate controlled environment. Check out Subway or Taco Bell first. They often will have discount admission to a local activity. It could be Sealife the Zoo or Nickelodeon Universe. Cub Foods has also been known to offer these discounts. Call before visiting because they aren’t always available. If you can nab one, it will bring your ticket down to the $20 range. Bundling is another option. You can bundle your Nickelodeon Universe Wristband purchase with a Sealife Aquarium, Flyover America or the Crayola Experience tickets. Their promotions page will let you know what’s current. This one is kind of cool. It gives the military member $10 off a wristband and four of their family members it too. 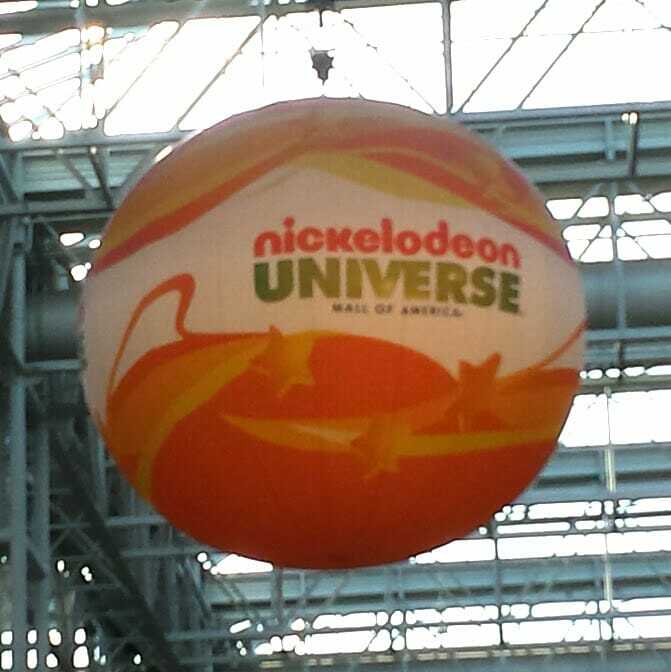 Just find Guest Services on the North side of the Nickelodeon Universe to get the discount. This deal will give you a wristband that is only available for 5 hours on any Tuesday on designated toddler rides. This wristband has many restrictions, but for $12.99, it’s a great deal for younger kids. The most popular savings option is the Twilight Saving. It’s unlimited for $27.99 after 5pm. The park is usually only open until 9, so you’ll have 4 hours to play. The only downside to it is the first two hours the park is still busy. Going to Nickelodeon Universe should be all about fun, so don’t stress out. Come prepared, and you’ll have a great time on your trip to the Mall Of America and Nickelodeon Universe.